Win tickets to One Night In Cape Town! Cape Town – Two lucky Channel24 readers can each win a set of double tickets to the One Night In Cape Town shows. In case you’ve been living under a rock, international acts Gogol Bordello, Twin Atlantic and Brand New will be playing the Oppikoppi music festival this year. Cape Town fans of the bands, who aren’t making the 3000km round trip to the Northam Limpopo, are in luck, for organisers Hilltop Live and sponsor Jägermeister have confirmed that One Night In Cape Town will be taking place from its new home – Shimmy Beach Club – in the format of two events this year. 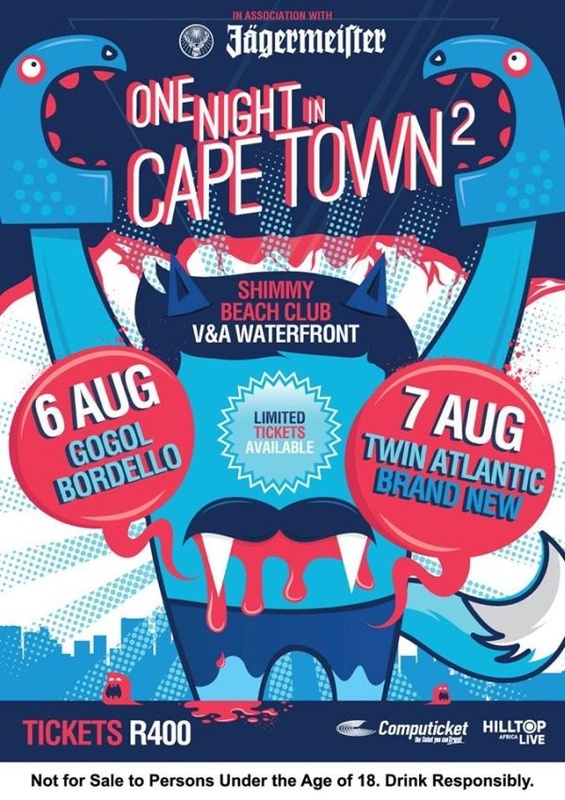 US gypsy punk kings Gogol Bordello will be doing a stand-alone performance on Thursday 6 August, while Scottish rockers Twin Atlantic and US alternative rockers Brand New will play on Friday 7 August at Shimmy Beach Club. Channel24 is giving away one set of double tickets to the Thursday night show and one set of double tickets to the Friday night show. Send us a photo of you at a music concert having a good time with the subject line "Thursday" or "Friday", depending which night you’d like to win tickets for. Entries close on Monday 3 August. Opening acts: The Plastics, Mr. Cat & The Jackal and The Nomadic Orchestra. Opening acts: SA artists still to be announced.